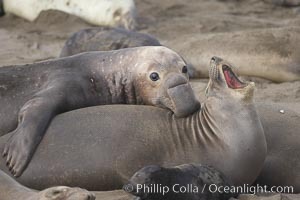 A bull elephant seal forceably mates (copulates) with a much smaller female, often biting her into submission and using his weight to keep her from fleeing. Males may up to 5000 lbs, triple the size of females. Sandy beach rookery, winter, Central California. Sexual Dimorphism / Male - Female Difference Photo. 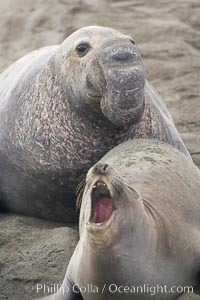 A bull elephant seal forceably mates (copulates) with a much smaller female, often biting her into submission and using his weight to keep her from fleeing. Males may up to 5000 lbs, triple the size of females. Sandy beach rookery, winter, Central California. Sexual Dimorphism / Male - Female Difference Picture. 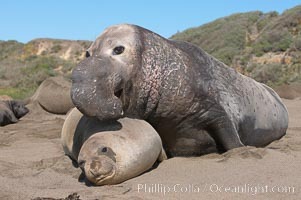 Elephant seals in the surf, showing extreme dimorphism, males (5000 lb) are triple the size of females (1700 lb). Central California. Stock Photography of Sexual Dimorphism / Male - Female Difference. 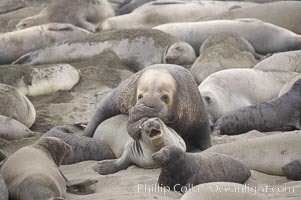 A bull elephant seal forceably mates (copulates) with a much smaller female, often biting her into submission and using his weight to keep her from fleeing. Males may up to 5000 lbs, triple the size of females. Sandy beach rookery, winter, Central California. Photograph of Sexual Dimorphism / Male - Female Difference. 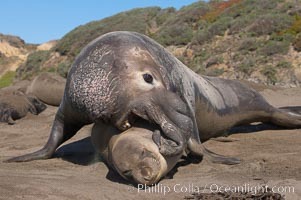 A bull elephant seal forceably mates (copulates) with a much smaller female, often biting her into submission and using his weight to keep her from fleeing. Males may up to 5000 lbs, triple the size of females. Sandy beach rookery, winter, Central California. Sexual Dimorphism / Male - Female Difference Photos. 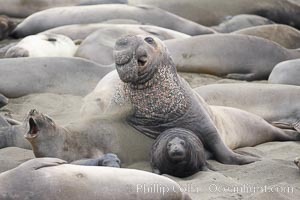 Elephant seals in the surf, showing extreme dimorphism, males (5000 lb) are triple the size of females (1700 lb). Central California. Sexual Dimorphism / Male - Female Difference Image. 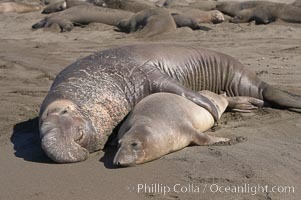 A bull elephant seal forceably mates (copulates) with a much smaller female, often biting her into submission and using his weight to keep her from fleeing. Males may up to 5000 lbs, triple the size of females. Sandy beach rookery, winter, Central California. Professional stock photos of Sexual Dimorphism / Male - Female Difference. 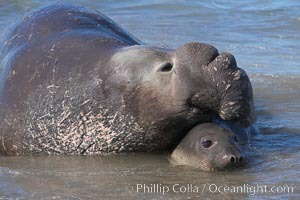 A bull elephant seal forceably mates (copulates) with a much smaller female, often biting her into submission and using his weight to keep her from fleeing. Males may up to 5000 lbs, triple the size of females. Sandy beach rookery, winter, Central California. Pictures of Sexual Dimorphism / Male - Female Difference. 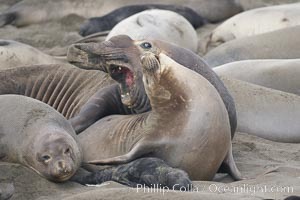 A bull elephant seal approaches a female before forceably mating (copulating) with her, in spite of nearly smashing the female's pup in the process. Sexual Dimorphism / Male - Female Difference Photo. 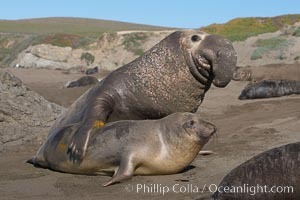 A bull elephant seal eyes a female before forceably mating (copulating) with her. Sexual Dimorphism / Male - Female Difference Picture. 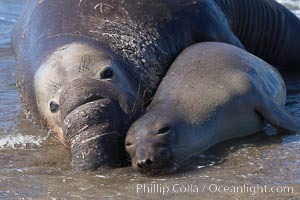 A bull elephant seal forceably mates (copulates) with a much smaller female, often biting her into submission and using his weight to keep her from fleeing. Males may up to 5000 lbs, triple the size of females. Sandy beach rookery, winter, Central California. Stock Photography of Sexual Dimorphism / Male - Female Difference. 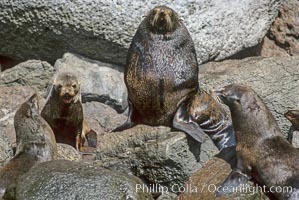 Adult male Guadalupe fur seal with females and pups. Photograph of Sexual Dimorphism / Male - Female Difference. Sexual Dimorphism / Male - Female Difference Photos.